Karmen Meyer at home with her Snake Plant. What do I qualify as a green thumb? Someone who has a natural way with plants, cares for them, and doesn’t give up on them when they look sick. I had a long streak of plants dying, a lot were orchids (I had no clue they went dormant) and I killed quite a few succulents. After this stint of “bad luck” I just figured I didn’t have the magic touch necessary to be a plant mama. But I honestly didn’t give it my best shot. Sometime after that, the plants started creeping back into my home, and after keeping a few succulents alive, and a big snake plant, the collection started to grow. My daughter (5) started sneaking squash seeds from dinner , into some of my snake plants and they started to grow, these were shady pots, in the middle of a harsh winter so we were all blown away. I took notice of her natural gift and started letting her care for my bigger plants, and I also was not scared to invest in more, maybe they wouldn’t die with her around! This was around the time I first met Karmen Meyer, A central Alberta photographer with a passion for diversity, supporting women, and living every aspect of her life consciously. Her beautiful home is bright, charming, and full of life. I can’t help but think a lot of her homes welcome atmosphere is caused by her plants, and I was inspired. One day, I hope to have as many plants as her. I met with Karmen recently to photograph her at her home in the country, and chat plants while all our kids played very loudly. I usually bombard her with questions about plants anyway, so I thought I’d share her knowledge with you all. 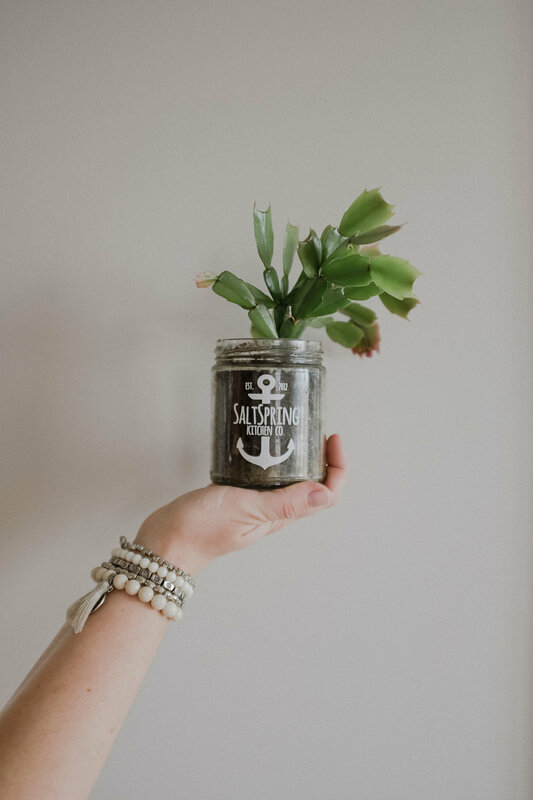 Karmen re-purposes a Salt Spring Kitchen Co. Jar as a planter pot. How many plants do you have? Some would say too many, I say not enough. How often do you water your plants? About once a week or when I notice some droopy leaves. Do you use plant food? Not very often actually. I'm a pretty firm believer in 'if it ain't broke don't fix it'. I do have a general liquid fertilizer that I give my green babies every couple of months (aka when I remember). But to be totally honest, this is only something I have recently started doing and my plants did fine for the years before using it! I can't seem to propagate anything, and I've killed countless vines, what am i doing wrong? Haha, well I honestly can't tell you for sure. But I can tell you what I do. For most tropical plants, I take a cutting (snip off a piece of healthy plant) and keep it in a cup of fresh water until it has lots of roots. Then I go ahead and put put it in soil. And Voila, a baby plant! For succulents I just break off a healthy leaf and place it on top of the soil, water occasionally and before you know it that baby will root itself into the soil. If you do this and your still having trouble I would consider changing your water source! Yellow curled up leaves mean...? Hmm. Yellow sometimes can mean over-watering. Sometimes it can mean spider-mites (YUCK!) or another pest. A little google search of your plant and symptom should hopefully pull up some pictures so you can make the official diagnoses. What are the easiest plants for people who can't keep anything alive? Oh the Snake Plant for sure! This one is a breeze, it actually does very well when it is completely neglected. I find Jade Plants quite hardy. ZZ plant is another great one! I have a Yucca that has survived cats, kids and some pretty serious droughts. Honestly it has thrived despite all odds. What are plants newbies should avoid? I know everyone says succulents are easy but I think that is total malarkey ( I am not allowed to swear right?). I find them rather fussy to be honest. In general I'd say start with small, inexpensive and easy-to-grow plants and just have fun with it. If it dies don't beat yourself up over it <3. Just go get yourself another and try again! Check out Karmen’s plant photography prints for sale here. Shop Karmen’s Bracelet set here. 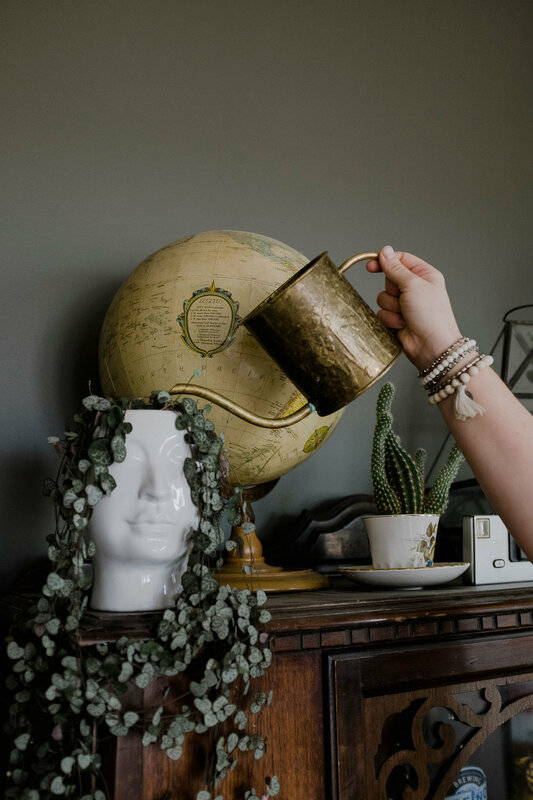 Karmen waters her plants in Volerra bracelet set from the shop. The pot for Karmen’s rosary vine couldn’t be more perfect. Karmen grooming her Grandmother’s Propagated Hoya.